This update is a few days late because I have been busy making new tooling and minor changes to existing foundry tooling. These changes were completed today and Lodi Iron Works is in possession of all tooling required for casting attempt #4 of the cylinder block. I have committed to give a seminar at next year’s MARC convention in San Diego (June 2011), and my optimistic goal is to have a running engine by then. If anyone has a question, concern, comment, or suggestion, please let me know at model.a.engine@hotmail.com, and I’ll do my best to resolve the issue. On Jan 29, 2011, good castings of the crankshaft, connecting rod and main bearing caps were displayed at the Turlock, Calif swap meet along with casting #1 of the cylinder block which was at the MAFCA convention in Vancouver, Canada. I was happy to meet and talk with several of the people that are on the Email update list. In addition, several others were added to the update list. Lodi Iron Works has cast 3 cylinder blocks. #1 had gating problems and the core was known to be broken during mold closure. The revised gating worked on #2, but it also had a broken core problem and was cut apart to verify integrity and wall thicknesses in the areas where the cores were intact. Wall thickness was good in all areas not affected by the broken core, and there was no porosity, tears, cold flow or anything else that would affect the integrity. Casting #3 also had a broken core problem. Attachments 1 and 2 are pictures of casting #2 which was cut apart. A technical meeting was held at Lodi Iron Works on 10 Jan 2011 when the core assembly for casting #3 was being assembled and a variety of chaplets were discussed that could be used to keep the cores separated to maintain casting wall thickness. Lodi Iron Works believes that the cores can be kept in position without chaplets since chaplets may create other problems including cold flow and porosity. No chaplets were used on any of the 3 castings. A second technical meeting was held on 28 Jan 2011 where everything was put on the table to be discussed in order to make this project successful and within budget. Every core box, pattern and every other piece of tooling was analyzed and talked about. The meeting culminated with an action item list where several minor tooling changes were requested, some new tooling was requested, and Lodi Iron Works has taken on the task to write a procedure to implement a stronger system for process control on the foundry floor to insure that the tooling will be used as designed, and this should provide the flat surfaces and good features that are needed for core positioning during core assembly. During mold assembly, the core assembly is placed in the drag (lower half of mold), and the cope (upper half of mold) is lowered into place. The cope weighs several hundred pounds and it is thought to be bumping and breaking the core assembly while being lowered. Longer alignment pins have been made for the cope pattern, a core box to form the longer alignment pins has been made, and extensions for the longer alignment pins have been made. These changes should make alignment easier for the crane operator as he is lowering the cope. In addition, the core boxes that form the upper and lower core holders have been modified to provide clearance to the cope on their vertical edges. 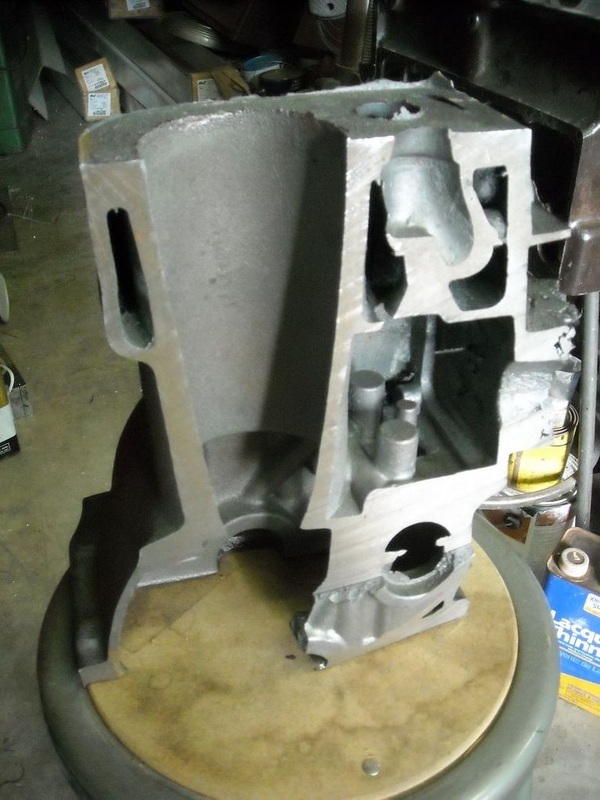 Other changes made to the tooling include stronger retraction springs on both the upper and lower water jacket core boxes, and modifying the valve chamber core box to make the upper and lower casting wall thickness greater by 1/16 inch. After the new and changed tooling is verified to work, casting #4 will be made. 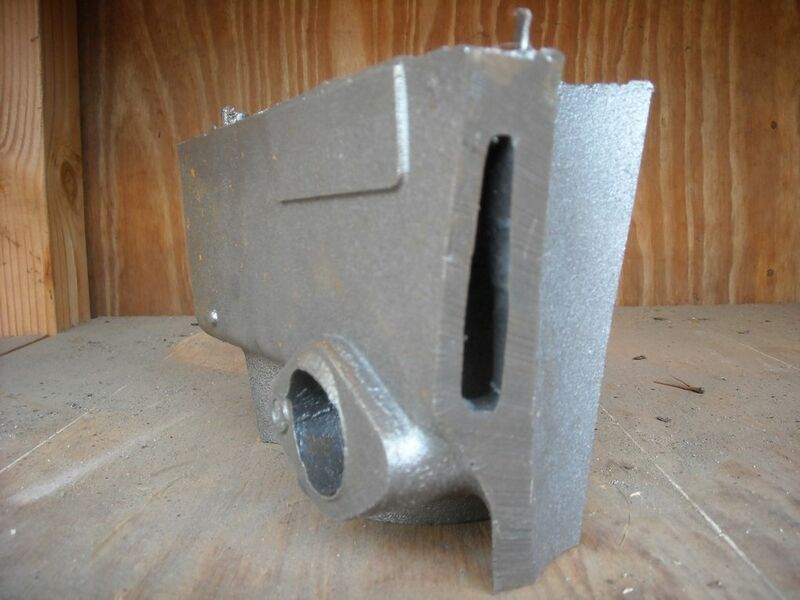 As stated above, good castings of these parts were displayed at the Turlock swap meet and are ready for machining. Compared to the cylinder block, these parts are very simple. The material that was used to cast these parts is Meehanite SP80 (80-55-06). Other uses for this material include suspension parts, and even off road front spindles where the stub axle is lowered to provide additional ground clearance. 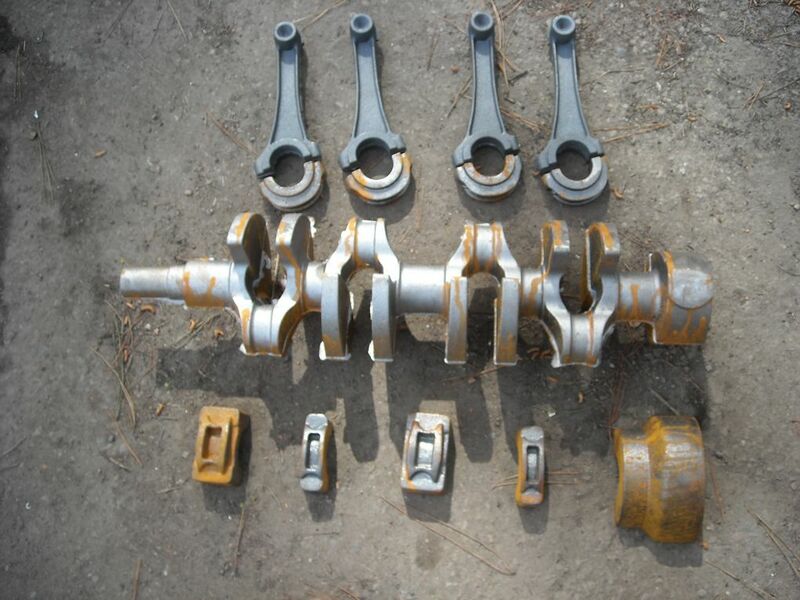 Attachment 3 is a picture of the crankshaft, connecting rods, and main caps. Good castings of the crankshaft and connecting rods have been created and are ready to be presented to machine shops along with SolidWorks descriptions of machined surfaces to obtain CNC machining quotes. This is on my "to do" list. The next update will be in 2 months or sooner.